Brexit explainer: What is happening next in the negotiations? 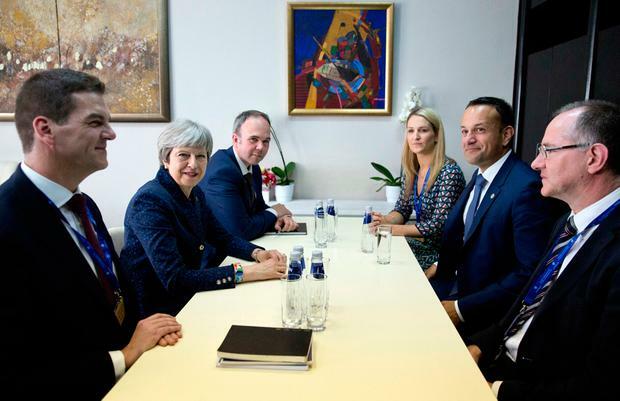 The Taoiseach and the UK Prime Minister Theresa May held a bi-lateral meeting in Bulgaria where Ms May put some tentative proposals to him on avoiding a hard Border in Northern Ireland. What did the Prime Minister propose to the Taoiseach? According to sources, the British government is willing to negotiate a customs partnership or arrangement with the EU, that would negate the need for a customs border. It would keep the UK in the EU's customs arrangement until such a time as another solution was found. Leo Varadkar said he would not disclose exactly what Ms May had offered, but made it clear that the plan from the British was insufficient. Partly. But according to the Taoiseach, based on what Ms May had proposed, a significant uphill battle remains. He said that for starters, the plans were verbal and not written, and at this stage, he was willing to take seriously only plans that were put in writing and "legally operable". Crucially, they did not deal with the fact that Ireland and the UK will have differing regulations and rules if Britain leaves the single market. And even though there may be no customs checks, there will have to be checks on goods crossing the Border. This was especially important in the case of animals for the agriculture industry as the EU's single market needed to be protected against potential diseases coming from countries that the UK is dealing with. It appears that the British have left this major part out. So are we any closer to sorting out Brexit? We're inches closer, but only inches. There is a palpable sense of pessimism among the government and EU officials that the UK will be able to get a reasonable solution across the line by the June deadline. However, they are grateful the proposals are not dependent on technology, because this has been roundly dismissed as unworkable. So the 'direction of travel' is indeed right, is how one source put it. What happens if there is no deal by June? In very strong terms, the Taoiseach warned this week that there may be no 'withdrawal agreement'. This comment tells us that the Government sees the prospect of the UK crashing out without a deal as being raised. Formal negotiations resume between the EU taskforce and the UK next week. They will have about two weeks to get things agreed by the June summit. Yes. The EU is the champion of brinkmanship talks, and has snatched victory from the jaws of defeat on many occasions.